President and Board Member, Saudi Arabian General Investment Authority-National Competitiveness Center Deputy Governor for Investment Affairs, Saudi Arabian General Investment Authority HRH Prince Saud Al Faisal is the Executive Director for Investment Policy Department at the Saudi Arabian General Investment Authority (SAGIA) and is tasked with establishing a more facilitative investment environment in the Kingdom of Saudi Arabia. Additionally, HRH Prince Saud acts as the Executive Director for Investment Attraction & Promotion, the department spearheading SAGIA’s mandate to promote the Kingdom as an attractive investment destination. 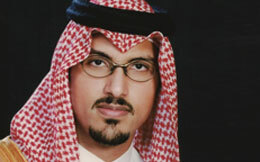 HRH Prince Saud is President of the National Competitiveness Center (NCC), an independent unit established by SAGIA in 2006. The NCC acts as a national competitiveness think-tank that monitors, assesses and supports the enhancement of competiveness in the Kingdom of Saudi Arabia. HRH Prince Saud also chairs the Saudi negotiation team for international bilateral investment treaties and is a member of a number of Regional Investment Councils in the Kingdom of Saudi Arabia. HRH Prince Saud currently chairs and sits on a number of boards of local and international government organizations and NGOs. Prior to joining SAGIA in 2008, HRH Prince Saud worked for Saudi Aramco where he assumed roles in a number of different departments. HRH Prince Saud received a B.S. in Finance from King Fahd University of Petroleum & Minerals, Saudi Arabia in 2001. HRH Prince Saud also attended executive programs at the Harvard Kennedy School of Government and the Madinah Institute for Leadership and Entrepreneurship. How cities are transformative entities that change continuously, creating resilience to external and internal pressures. The discussion will focus on leapfrogging using new technologies and governance solutions in Africa, Asia and Latin America.